Step 1: First remove the eye makeup as eyes are the most sensitive organs. You can use Vaseline, baby lotion or baby oil to remove your eyeliner, mascara, and eyeshadow. Step 3: Now it comes to removing the face makeup but before that, you can steam your face. This helps to open up the pores and your makeup comes off easier. Rub some cold cream on your face and leave it on for 3-4 minutes. Wipe it off with a soft towel or a tissue. Step 4: Always wash your face after removing makeup and not before that. • Olive oil is one the best makeup removers. It removes makeup effectively and doesn't leave your skin dry. • Honey and baking soda: Just pour a little honey on cotton or a washcloth, sprinkle little baking soda and then use it to wipe off your makeup! • Milk: If you are wearing a light makeup, you can rub it off with milk. 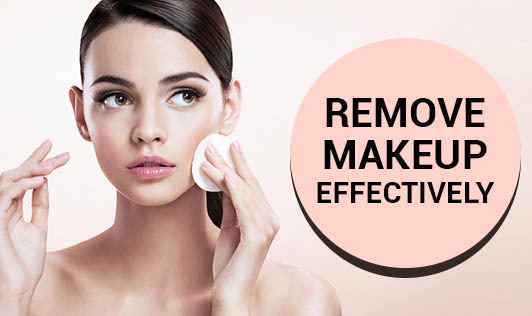 Remove your makeup properly and enjoy beautiful and youthful skin!